Are You Tweeting Your Potential Employees Away? There’s no denying that I love Twitter. And I know a lot of you do, too. With 284 million registered users, its a perfect place to look for candidates, especially those active in their industries and are thought leaders. Recently, I can’t help but notice that a lot of people are trying to shoehorn their “usual” talent acquisition strategies into Twitter’s framework, and I can already tell you this: It’s not going to work. The issue is that this company is huge, with retail branches in pretty much every metropolitan area in America. (For example, here in Chicago, there are three different branches I can frequent without driving more than a few minutes.) Along with all those retail branches, they have a massive headquarters in the Midwest and regional distribution centers scattered across the country. In the world of talent acquisition, we think every problem can be solved by sending more job postings. And that’s not true at all. So when the company tweets a job, what percentage of its followers will actually be able to apply for that job? For a job based at the Midwest headquarters (where there is the highest fan density), only 14 percent of the followers could reasonably expect to apply because they live within driving distance. This means that the company just spammed 86 percent of its followers. And if it promotes a branch manager job outside its HQ, it could only be reaching 1 percent (or less) of its follower base. How many useless tweets does it take for a person to stop following your Twitter account? 10? 20? If you continue this strategy, you’ll find out pretty quick. But that’s what most companies do. They have a channel, so they flood the channel with job postings. It’s like the joke that “to a man with a hammer, every problem looks like a nail.” In the world of talent acquisition, we think every problem can be solved by sending more job postings. And that’s not true at all. This isn’t a hypothetical situation. 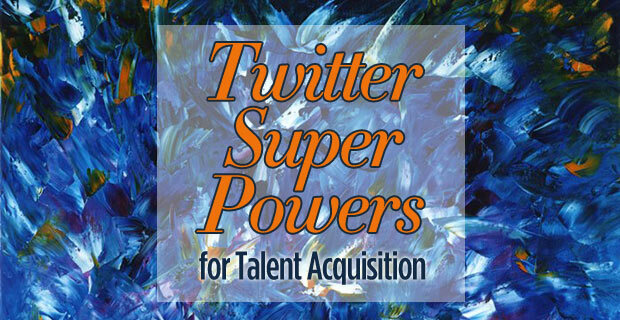 One talent acquisition Twitter account, that I won’t name, just posts directly from their ATS. They’ve tweeted 2,500 times and only have 130 followers. This is a massive national brand you would all recognize, and their careers account only has 130 followers? Given a pretty standard distribution relative to the U.S. population, that job in Pensacola was potentially only of interest to one of the 130 followers, annoying the other 129. The next job in Pittsburgh might be attractive to two of their followers. Who would follow an account where 99% of the material wasn’t useful? I wondered if the follower list was just bots and spam accounts, so I used a spam tool (Simply Measured has a decent tool), I found that Twitter lists the talent acquisition account as a spam account. This national brand, by automating its job feed into Twitter, turned itself from a beloved consumer brand into a spammer without ever realizing it. And without getting any return on their efforts. Beyond the logistics of having a very geo-targeted job distributed to a wide network of people, there’s another major issue with Twitter: You can’t convince anyone of anything in 140 characters. Here’s a list of things Twitter is great at: complaining, asking people for ideas, quipping, talking about what you are doing/seeing/feeling, sharing news and thanking someone. Unfortunately, none of these things are particularly persuasive. You can’t convince anyone of anything in 140 characters. If you post a job to all your Twitter followers and someone applies, I can only tell you this: They were already going to apply for the job. “Project manager job at our San Diego location, great team! [link]” is about as persuasive as “Hey you! Click this! [link].” People who do click are already predisposed to click. Alternatively, the people who click are simply “click happy” and will click on every job posting they come across without any discrimination; perhaps they are incredibly desperate to find a job. And you don’t want to interview the person who just clicks on every available job posting, do you? So, based on all of the above, it sounds like Twitter is a waste of time for talent acquisition, right? Wrong. Twitter can be a powerful tool if you treat it as a tool that can do more than simply distribute job postings. What Twitter (and, to be honest, most social media) does well is something we can think of as “micro conversions.” Twitter can’t get someone to buy something, but it can get a reader interested in a picture of the product. That interest in the picture can then inspire interest in the product and eventually, result in a sale. The tweet didn’t create the sale (or conversion), but it led to a webpage where a conversion could happen. How do we apply this approach to talent acquisition? A tweet shouldn’t link to a job, but rather, it should link to a place where the reader can find material that engages and informs. This “place” sounds like your career site to me. Keep in mind that you can’t just drop your Twitter followers onto your career site homepage—that’s asking for trouble. In the second or two it takes to get from the tweet to your homepage, readers will forget what prompted them to click the link in the first place. Directing them to your homepage is like saying “There’s something amazing in the next room!” and then leading them into a room filled with worthless junk. Maybe, if they look hard enough, they’ll find a gem in all the detritus, but more often than not, they’ll just turn around and walk away. You can’t expect them to do the work. If you want them to see something, create the shortest path to that thing. The best way to maintain their interest is to send them to a page with content that engages and informs them. That content should be connected to the job you really want them to see in a way that’s easy to see—don’t make people search for it. Imagine that you are the large retail chain I previously mentioned and that you are trying to drive more interest to your IT jobs. You could build a great page of content about what it’s like to do IT work at your company and include Instagram pictures of real employees doing real work. You could also incorporate employee quotes and testimonials from those who appreciate or benefit from your employees’ work. Most importantly, you could include links to your 5-10 most-needed IT jobs. In this example, the tweet’s job was to get followers interested in the content. Once landing on the content page, followers learned more about the company at hand, including its work culture and the everyday life of an IT employee. And right there, in a semi-obvious place, was a way for followers to look at job listings and sign up for job alerts. Using Twitter to generate micro conversions is much more beneficial than just using it to push jobs onto whomever happens to be reading. When you recast Twitter as a tool that creates interest in your content, you can finally harness Twitter’s full power. (And that’s a lot of power!) As a result, your talent acquisition strategy will receive an incredible boost, and you’ll stop driving away followers.